I was pleased to see Towers grab the fallen gun and then stunned as he aimed it at me! I looked at the white-haired heavy weight in our doorway and asked, “Who are you?” I’m real quick witted that way. The woman stepped forward and extended a mitt that was nearly big as mine. We shook hands and I reminded myself to check my pinkie later for fractures. 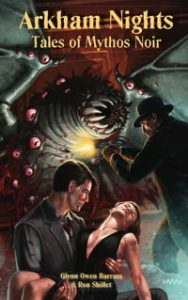 We’d truly entered an underground world of nightmare even the sinister streets of Innsmouth couldn’t bear to hint at. …A mass of living white grease or filth, about thirty feet wide and sloping up to around half that in height, it was covered in pink, shiny globules of various sizes. That it was alive was obvious, for it pulsed and moved rhythmically, but not naturally. With a stunning cover by M. Wayne Miller! Revised from the original edition published as Two Against Darkness, by H. Harksen Productions. This entry was posted in Publication on April 27, 2016 by elipsett.